Kailua-Kona, often referenced as simply “Kona”, is an infamously beautiful tropical getaway located along the shoreline of Kailua Bay and up the southern slope of Hualālai volcano. Reputed for the region’s bold Kona coffee beans, which are cultivated on the slopes of Mount Hualalai and Mauna Loa in the North and South Kona Districts, this exotic Hawaiian destination is also hosts popular events such as the annual Ironman World Championship Triathlon and the Hawaiian International Billfish Tournament. Stay at one of the island’s gems, The Dolphin House, located in the exclusive, gated and security-guarded community of Kona Bay Estates! The Dolphin House is situated directly on the deep sapphire blue waters of Kona Bay and is just steps away from a private sandy beach (not to mention within walking distance to tennis and town!). 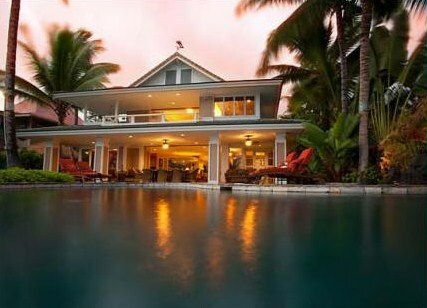 This stunning oceanfront home, known as “Ka Naia” in Hawaiian, is an upscale 4 bedroom, 4.5 bath home that boasts an atrium entry with cathedral ceilings, skylights, large living room, family room, convenient indoor/outdoor dining, and a game room with a fully equipped bar. Take a dip in the heated swimming pool and splash under the spectacular pool waterfall! A short oceanfront stroll leads you to a sandy, reef-protected beach cove lagoon, great for swimming, snorkeling, and playing in the sand. Tide pools offer great exploration for children and teens, and can be found scattered along the lava rock shelf. Enjoy nature’s marine creatures and catch a glimpse of turtles, dolphins, and whales! 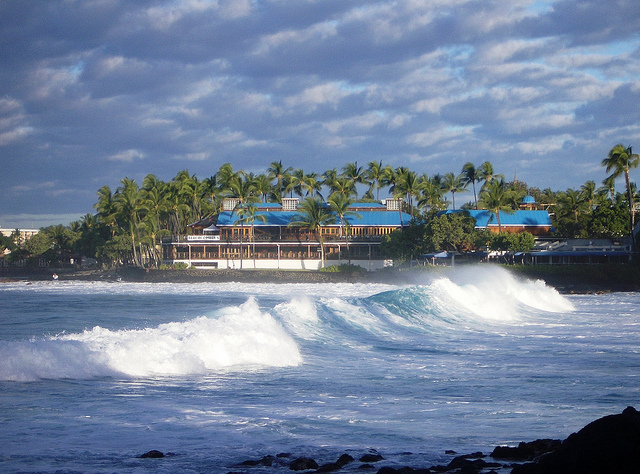 The Big Island of Hawaii offers a myriad of activities for every age. Exciting and exotic island activities include visiting the Kona Coffee Farms, Botanical Garden Tours, Sunset Dinner Cruises, Parasailing, Whale Watching, Hawaiian Luaus, Horseback Riding, Submarine Rides, Snorkeling and Volcano Viewing, just to name a few! Take one look at this slice of paradise and you will instantly fall in love with The Dolphin House! Sandcastles – not just child’s play anymore! If you’re going to live the beach-house lifestyle, there’s one skill you can’t do without, and that’s the ability to build a respectable sandcastle. True beach lovers know that there’s nothing more relaxing than feeling the sun on your back, the wind through your hair, and wet sand on your hands as you construct a fairy-tale castle fit for a pint-sized king. But if it’s been a few years since you dabbled in the sand-related arts, you may need some pointers from the experts. And strangely enough, there are experts. 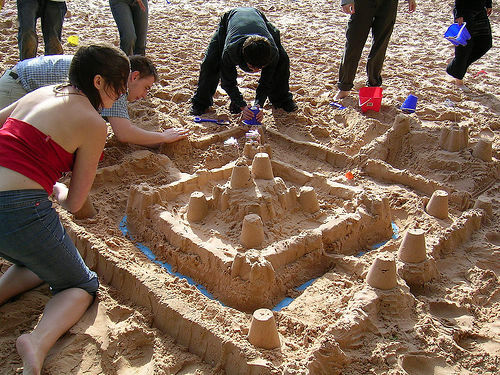 A whole community has grown up around the art of sandcastles, with contests, Web sites, and even newsletters. So before you jet off to your beach-house vacation, get prepared with the following overview of sandcastle building. It’s all a matter of patience, the right tools, and lots and lots of, you guessed it, sand. The first step to a successful sandcastle is a good water source. You can either dig a hole down to the water table (so that it fills with water) or get yourself a big bucket of seawater. You won’t get anywhere with sand that is too dry. Then it’s all a matter of carving. Yes, carving. 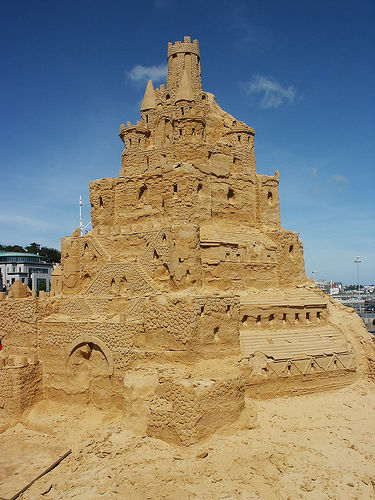 It turns out that sandcastle experts generally carve sandcastles from large mounds of sand, rather than attempting to build from the bottom up and forming flimsy (read doomed) walls and towers. They get themselves a nice pile of wet sand and carve it down into a castle shape. To be a successful sandcastle-carver, you need tools. Whether you use Popsicle sticks, shells, shovels, spatulas or just your hands, you need a variety of tools to do a variety of different jobs, from carving out a tower to drawing in a window with a little sand princess looking out. Start at the top of your pile and work downwards, that way the sand won’t roll down and destroy your work. 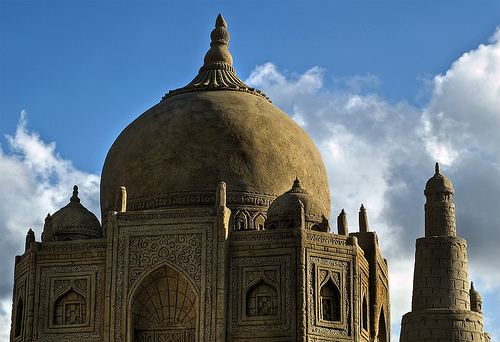 Carve out a few towers, and pick out a suitable roof for your structure. Put in a few turrets and maybe a window or two. As you get to the bottom, add some landscaping, or maybe a moat. The key is to go slow, and carve off just a little at time. If you get impatient, and scrape off a big chunk, you’ll have to start over again. Relax, get into the mood, and watch your dream castle slowly appear. But don’t get too attached. High tide will be here soon. Schedule of upcoming sandcastle-building contests from www.sandworld.com. Comprehensive guide to sandcastle contests, from www.sandcastlecentral.com, your online resource for all things sand sculpture. Home page of Sandscapes – a team of leading, sand sculptors, Brad Goll, Dan Belcher, Fred Dobbs, Kevin Crawford, and Greg & Brandi Glenn. Lots of information about their technique, links, photos, and more. Kirk Rademaker – sandsculptor / interactive environmental art and more. Page for professional sandcastle builder group. Tons of links and pictures, even a sandcastle chat room. In 1999, on a surf trip to the Mentawai Islands (a chain of about seventy islands and islets off the western coast of Sumatra in Indonesia) Dr. Dave Jenkins, physician and surfer, fell in love with more than the epic waves - the Mentawai people. These people, mostly women and children, were dying from preventable and treatable diseases like malaria, measles, cholera and tetanus. Once Dr. Dave returned home, he couldn’t forget the people he had met in Mentawai. A year later, in 2000, along with his long-time friend Dr Steve Hathaway, they co-founded SurfAid International, a non-profit organization dedicated to the alleviation of human suffering through community-based health programs. SurfAid is always coming up with fun events that you can be a part of – think art auctions with a portion of the proceeds benefiting SurfAid, or Swim4Humanity, Kick4Humanity and Paddle4Humanity days. Bookmark their EVENTS page to stay in the loop on events happening near you! This is how a simple surf trip ended up changing the world. Don’t you just love people like this?! Do you know SurfAid? 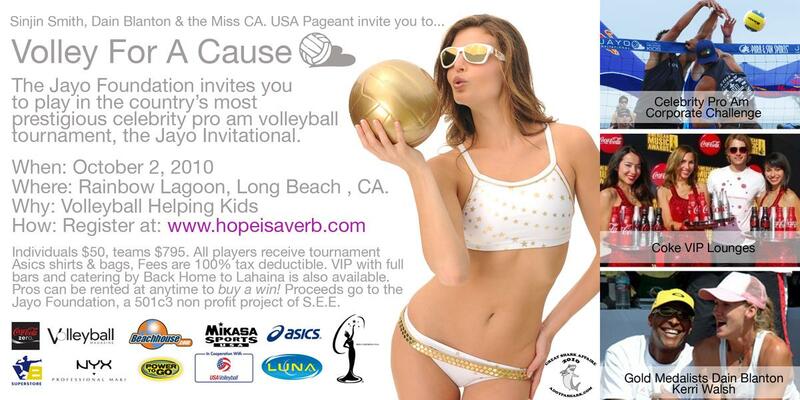 Have you ever participated in one of their events? We’d love to hear from you in our comments section! Huacachina is a small village located in the Ica Region, in southwestern Peru with a population of only 115. It’s built around a small isolated lake in the desert called the “Oasis of America,” and has long served as a resort for local families from the nearby city of Ica and a stomping-ground for Peruvian elite. Those familiar with Peru’s currency may recocnize Huacachina fromt he back of the S/50 note. Increasingly though, Huacachina has become a popular destination for offbeat thrill-seekers and backpackers who come to shread the hundred foot+ sand dunes that surround the oasis villiage. These sandboarding tourists have somewhat come to run the show. What was once towering palm trees, lush foliage and buildings from days gone by has been virtually transformed as a majority of the hotels, restaurants and businesses are now catering to these new tourists that are known for their all night parties. Not that the Peruvians are unacustomed to some wild nights. Back when the Spanish ruled Peru and grew tired of waiting for their beloved wine to be shipped to them every 6 months, they planted their own grapevines and began making, what turned out to be, quite the tasty vino. The Peruvians, however liked their spirits a little stronger, which resulted in some of the wines being distilled and turned into waht is now their national drink of choice – pisco (named after the important nearby port of the same name). The pisco sour, a delicious drink made from pisco, whisked egg white, lemon juice, syrup or sugar, crushed ice and a little bitters, is delicious and refreshing. If you’re interested in visiting Huacachina, there are a grip of hostels and inexpensive accomodations to be discovered (try El Huacachinero) that make Huacachina a perfect stop for those traveling throughout Peru, perhaps on their way to Cusco and the Incan Trail.